I’m developing a series of articles to help homeowners reduce their power consumption in a step by step way. The outline for the series was a piece of cake. Filling in the specifics, however, has been a bit more of a challenge than I first thought. Truthfully, I’m still stuck on the second article: “Identifying the Electricity Consumers in Your Home.” The title for the second article also changes all the time, so don’t go looking for it when it’s finally published. The thing is, assessing your plug load, particularly around lighting, is relatively easy. You look up at the ceiling, figure out how many bulbs are on, what their wattage is, estimate the number of hours they’re on during a 24 hour period and you’ve figured out your lighting load. But the rest is a little trickier. While I was doing my lighting consumption for my house, I discovered that lighting accounts for 20% of my overall electricity consumption. That means 80% is unaccounted for. Using my trusty Kill A Watt, I can get to the gaming stations, the lamps, clocks, TVs, and phones. But what about the appliances whose plugs I can’t reach? Or the built-ins that hide the plugs and make it difficult to access? Enter the Power Cost Monitor. This is another electricity monitoring device that allows you to measure electricity consumption for any electrical device in your home, including your central air conditioner, oven, dryer, and any hard to reach electronic or appliance where you can’t access the plug. The Power Cost Monitor sounded intriguing so I contacted Peter Porteous, CEO of Blue Line Innovations, the company that makes the Power Cost Monitor, to find out how it works. The device consists of two parts — the first part you hook up to your electricity meter. The monitoring unit is compatible with 90% of all electric meters in North America. The monitor reports changes in electricity consumption at 30 second intervals. This is the outside amount of time their customers are willing to accept. Reporting periods longer than 30 seconds lose their relevance because so much can happen in 30 seconds. A few lights can get switched on, someone can turn on the stove, start watching a movie or start a load of laundry, and you don’t know which action has caused the increase in power use. Now the Power Cost monitor can hook up to your computer using WiFi so you can see your readings in chart form and track your consumption over time. Kids love to use it because they point it at a device, like a dishwasher, start pushing buttons on the dishwasher like “power scrub” or “heat dry” and watch the numbers on the monitor climb. Then they’ll do the same with the washing machine, adding “hot water” or “second spin” and see the same thing. They learn how behaviour and choices affect the amount of electricity we consume. You can see how receiving your electric bill once every two months isn’t giving you nearly enough information for you to act on. Having information fed to you every 30 seconds helps you identify how much electricity devices in your home are using, and suddenly you the information you need to start doing something about it. Discovering what your base load is, that is, what’s using power even when everything is off, can help you take concrete steps towards lowering your consumption. Peter told me that when he first used his monitor, his baseline electricity consumption was 1.1kw/hour. Now, after identifying behaviour patterns, phantom powers and appliances that were using a lot of electricity, he’s been able to reduce his baseline load to 300 watts/hour. For a dealer near you, see the Power Cost Monitor website. I’ve been browsing through old posts to see if I could come up with any “gift suggestions” for all the green builders out there. There is a definite slant towards practical materials in these posts. I don’t think anyone would be thrilled to see SIPs panels, a bag of insulation or a 3 litre toilet under the tree. But I do think a bucket of all natural iQ cleaners would make a nice house warming gift! 1. The Kill-A-Watt. Are you really surprised by this one? It’s one of my all-time favourite measuring tools. I’ve used it on almost every appliance and gadget we have in our house. It’s straightforward and easy to use and measures the number of watts your computer, TV, iron, toaster, basically whatever you plug into a wall, uses. It’s a great gadget to identify the biggest and smallest energy users in your house. Available through amazon.ca and other retailers. Energy-Wise Landscape Design: This is a wonderful and thorough book for the avid gardener in your life. It is not a picture book but rather a comprehensive look at how to landscape your property to lower your energy bills (cooling in summer and heating in winter), and save water. It is meant for any climate zone. The appendices help you with calculating tree height and latitude, as well as plant selection. Available through www.energywiselandscape.com. $29.95 plus shipping. A Milk Paint Painting Course: Milk paint is an all natural product that contains no petrochemicals consisting of a mixture of limestone, clay, casein, and natural pigments. It’s a zero VOC product that soaks into surfaces so it never peals or chips. Learning how to mix and apply isn’t difficult, but sometimes it helps to watch someone else do it first, so Homestead House, the only Canadian Milk Paint manufacturer, offers courses in learning how to paint with its product. What a great gift for the do-it-yourselfer! See their Services Page for more information on painting classes. Cork gifts and accessories: Cork is an amazing product with so many different uses. It grows on the cork oak tree in the Mediterranean. The bark can be harvested every 9 years for up to 200 years. 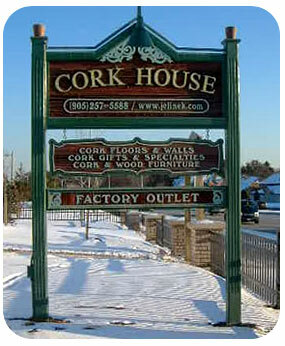 At the Cork House in Oakville, the store is overflowing with accessories made from cork. In addition to the flooring I wrote about, there are handmade decorative cushions, cork furniture, both upholstered and wood/cork combinations, cork pads of all kinds, watch staps, cork-bound journals, purses, toilet kits….you get the idea. The store is located in Oakville in the oldest building in Halton Region. In today’s Globe and Mail, Karen Howlett reports that consumer electricity prices are set to rise by 25% by the end of 2011, or, for the average consumer, about $300 per year. The hike has to do with the combination of the implementation of the HST, (adding an additional 8% to your electricity bill), the recent change to time of use pricing, and most importantly, the awarding of $15 billion in renewable energy contracts for power generation in Ontario. While the consumer side of me groans at the increase in electricity prices, the environmentalist side of me applauds the government for its forward-thinking and responsible decision to promote green power. Well, I only partially applaud. I’m not particularly crazy about the HST. Time of Use pricing has recently come into effect. You’ve been given the opportunity to use your electricity more wisely by doing all of your chores at night when lower electricity prices are in place. If you’ve never used the delay buttons on your dishwasher or washing machine, now is the time to start. Put your kill-a-watt to work, find your power hogs and get rid of them, change your light bulbs to CFLs, or try out some LEDs, and buy power strips with built-in timers so you’re not using electricity when you don’t need it. Do as the Europeans do — if you’re not in a room, turn the lights off. Take advantage of savings available on the every killowatt counts website to add ceiling fans and EnergyStar rated air conditioners and power strips, if you don’t already have them. Consider applying for the Micro-FIT program and feed into the electricity grid for a guaranteed return for the next 20 years. Sign up for PeakSaver if you haven’t already. You’ll get $50 back on your next bill and you won’t even notice when they cycle down your central air conditioner. You might not have thought about it, but if you look around your home and think back to 20 years ago, we have a lot more stuff plugged into our walls than we did then. There are cell phones and Blackberrys, cordless phones, several TVs , at least one or more personal computers, think of the number of iPods your family has, gaming consoles, DVD/VCR players, surround-sound systems, alarm systems, coffee makers with built-in clocks…a lot of these gadgets didn’t even exist 20 years ago. So, while today’s large appliances use approximately 3 times less electricity than those from 20 years ago, we have so many small ones now that any efficiency gains made by the large appliances have been completely wiped out by the introduction of all the small ones. According to a Stats Canada report, between 1984 and 2002 large appliances energy consumption decreased by two-thirds, but small appliance energy consumption increased by 105%! Standby Power: One of the things the electronics companies developed awhile ago was keeping electronics such as TVs and computers running on a small amount of power even when they’re technically off so that they don’t take forever to warm up like the TVs of old (I remember being able to make popcorn — on the stovetop — in the time it took for the TV to warm up when I was a kid — yes, I’m that old!). One of the problems with this development is that your appliances’ power is on even when it’s off, if you follow me. They might draw as little as one Watt per hour — but multiply that by 24 hours/day, 365 days/year by 5-10 appliances by hundreds of thousands of households and you get a lot of wasted power. In fact, Consumer Reports estimates that 8% of all power consumed by households is standby power, or more than 108 billion Kwh in the US. Determining where to cut back. I’m not suggesting you give up your small appliances — but you might want to cast a critical eye through each room and determine what really needs to be plugged in all the time. Could you subtitute any of your cordless phones for ones that don’t use electricity? Do you need all those TVs or game consoles — or do they need to be plugged in all the time? Do you need a DVD player when the PS3 will do both jobs? How often do you actually use your VCR anyway? Does it need to stay plugged in, or could you just plug it in when you need it? (Just put masking tape over the flashing clock like my stepfather did so you don’t have to reset it all the time!) Can you put a group of these electronics on a power bar and turn everything off? But be careful what you put on a power bar — avoid things that need resetting every time you turn the bar on, like wireless routers, or anything that uses a fan for a cooling down period after its been turned off (a plasma TV for example). There are some nifty power bars with sensors to determine when people are in the room, and another that determines what the most important electronic in the group is (the TV or Computer for instance), and keeps that one running while the rest turn off — but so far they’re not available in Canada. You can read about them on Treehugger.com. MeasuringYour Electricity Consumption appliance by appliance. My favourite little green gadget, the Kill A Watt, has just become easier to use. The latest model is the Kill A Watt EZ, a device which measures how much power anything you plug into a wall uses. The one I have measures Watts, but the EZ turns everything into dollars and cents so you know how much money your appliance will use in a year (you have to program in the rate, but you can get that from your last hydro bill). Plug your TV into it and see how much electricity it uses in the on and off modes. Do the same for each appliance to discover which are the largest electricity hogs in your home. The Kill A Watt is usually available for sale at home shows and on Amazon. I bought mine at the Cottage Life Show for $75. The National Home Show is February 19-28th, as well as the Green Living Show, April 23-25th. You can also buy it online from the stores listed below. Green Gadgets sells it for $33 (I think I might have gotten ripped off!) — but they don’t have the latest model. It’s an online store. Check shipping costs.